I had you swim a few laps to warm up while I watched and looked for high priority improvement opportunities. I recognized your body and stroke from the videos I’ve reviewed in the past! I was pleased to see that you had retained many skills we had worked on, though you have been out of the pool for a while. I was especially pleased to see that you had #4, the Arm Switch Timing in place. Though better than it was in the past, I felt you had room to improve #1 – your Torpedo Frame, to bring the legs even closer, parallel to the surface. Now that we are finally working together in person, I could show you better how to use the internal frame of your body to lever your legs closer to the surface. I used the analogy of an asymmetric teeter totter, to show how the body is naturally unbalanced over the pivot point of the lungs, with the hips-legs being far heavier and sinking for many of us. So we need to create a frame through the core of the body, including the legs into this frame, and then ‘shift weight forward’ using the head, shoulders and arms as ballast. There is nothing external to push on, so we use the internal ‘tensegrity’ system of the internal muscles and tissues to lengthen, brace, then lever the lower body upward. The internal leverage alone is not enough. We also need to direct the flow of water under the frame of the body, especially under the long, straight and ‘light’ hips and legs, allowing them to slide over the top. We also allow the flow of water to press against the angled lead arm, adding another point of slight leverage through that frame of the body. * You are actually sending water under the Skate side track of your body, but I wanted you to feel like the whole lower end of your body is like the lower half of a surf board sliding over the water. You picked up these adjustments well and immediately brought your lower body much closer to the surface, brushing your swim suit against the surface on many strokes per length. Very well done! In the second part of the lesson we examined the catch/pull. You can read more about The Catch, in this standard lesson outline. To help you improve the effectiveness of your catch/pull on the water, we need to look at the shape of the catch and the path or trajectory of where you press. I used the analogy of the ‘beach ball’ of water molecules. In today’s lesson we worked on features #2 and #3 – straightening and lengthening Skate Position, and increasing the momentum you generate with the Recovery Swing. Then we worked on improving synchronization of the catch-torso-entry/extension to increase your sense of acceleration on each stroke. I wanted you to see how you use the fully extended Skate Position to deliver force into forward motion. The more committed you are to the position, the more fully extended through the arm pit and torso all the way down the leg, the more that side of the body can transmit the wave of momentum forward. Also, you may view the stroke as a linear action, rather than a circular one. Like cross country skis, in their rut on the snow, only slide forward or backward. Your body has elastic properties and during the recovery swing, entry and extension you are stretching out that elastic side of the body, building up potential energy, and then on the catch, you are contracting back. One side is extending, stretching the elastic band, and the other side (during the catch) is contracting. I explained the analogy of an underwater ladder to direct your extension forward and to guide the path of the catch backward, as well as to set the depth of the catch – not too deep (with a straight arm) and not too shallow (hand too close to the torso as it passes underneath). The recovery swing and ideal entry position is meant to tilt the elbow into its upward-and-outward angle through the entire swing, entry and extension, so that at the moment you set the catch, the elbow is already at the correct angle to allow the forearm to scoop inward-and-downward at a 45 degree angle. During your left recovery swing, after initially dragging the hand behind the elbow, you need to swing the forearm in front of the hand a little earlier so allow the joint to open up an avoid that popping moment. But still keep the elbow climbing higher, up to a high elbow entry position. The sliding of the whole shoulder unit (the clavicle and scapula) is critical for helping that joint to move forward and open up, permitting an obstruction free swing of the arm. During the left catch, you need to let the elbow drop slightly to prevent irritation to the joint, while still scooping the forearm inward to get a grip on the ball. I had you lay in Skate Position to feel the ideal elbow position, to feel how you will extend the arm forward, with the shoulder rotating inward, the elbow rotating to point sideways, rather than downward. In Skate I then had you practice setting the catch, with that elbow position. We noticed that the left elbow could not rotate as far upward as the right side without causing some irritation in the joint. So, for this you may compromise to get your left forearm to scoop inward and downward as far as is comfortable, to get the best grip on the water with the forearm as you can. Lastly, we worked with synchronization of the Entry and Torso, the Catch and Torso, and then all three working together. I had you practice blending one combination, then practice blending the other combination, and then blend all three together to feel a smooth, immediate transfer of force from the catch side to the extending side, helping you slide farther forward on each stroke. Synchronization is the most satisfying thing to practice, with endless ways to adjust and make it feel better and more effective in all kinds of swimming intensities. I understand the theory of the synch, but I would like to review the drills, so I can repeat those at home. Today we continued with work on synchronization, which brings together most of the features we’ve worked on in the previous sessions. The Torpedo Frame of your body may not be up front in your awareness in these second two lessons, but you were still retaining some of that, which is pleasing to see. As that long, stretched frame becomes more habitual for you, the synchronization work will produce even better results. For AC, I gave you the focal point for feeling an elastic band connecting your wrist to your hip and when then arm enters and extends, it pulls the hip forward behind it. This tends to be the more preferred focal point for distance swimming, and at moderate tempos. The idea here is to use smaller shoulder and arm muscles to hold the shape of the catch, and use the big back and torso muscles, through rotation, to do the heavy pulling on the ball. You can be powerful in the catch/pull, and in the entry/extension, but that power must be increased gradually and applied smoothly. In the case of the catch, you don’t want to pull abruptly and ‘pop the ball’. In the case of the entry/extension, you want to slice into the water smoothly to get water molecules starting to move out of the way in a uniformly and thereby faster. For AB I had you focus on moving the two hands, on their respective tracks, away from each other in exact opposite directions. Think of the ladder below you and those two arms and hands are fixed to their own respective tracks, only able to move straight forward or straight back, while under water. Furthermore, I had you focus on moving those two hands away from each other at a proportional rate. The catch is pressing backward with a certain amount of pressure and the entry/extension is slicing forward at a certain speed. You search for the right proportion between those two so that you are sliding the lead arm forward more than you are pressing the catch hand backward. For ABC, I had you move your viewpoint to the center of the torso, to feel both the arms working at the same moment, in a balanced way. You should feel them both blended with the torso rotation so that neither the catch/pull nor the entry/extension feels too soft, or too abrupt and out of proportion with the torso rotation. They are both working in unison with the turn of the torso, deriving most of their power from its rotation. The overall feeling should be powerful and smooth – pleasant even at higher intensity. To improve that sense of forward slide – to improve a sense of acceleration, actually – we stepped back to work on the Entry Position and pathway for a little while. Time the hand entry right with the set of the catch for immediate, smooth transfer of force from catch side of the body to the entry arm in time for underwater extension. You did very well with this also, making corrections immediately. We noted your need to be careful on the left to swing forearm forward on recovery swing just a bit earlier than on the right in order to avoid the popping point. And to straighten out that wrist right as it plunges into the water. 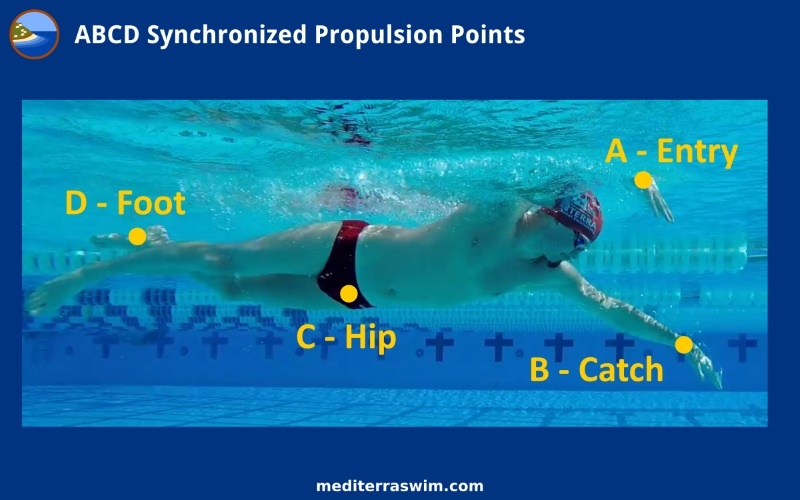 Lastly, we went back to review the sync points with this tuned up Entry Position in place to feel the improved effect of directing rotational force into the water sooner, getting more water molecules to start moving out of your way. In today’s lesson, we worked on the feet. Specifically, we worked on your Counter-Balanced Foot Position (CBF) which would set you up for a more consistent, more effective 2 Beat Kick. You may read more about the Counter-Balanced Foot Position. And this segweys into the 2 Beat Kick. Then we transitioned into synchronization of the feet with the front of the body. We assume that the sync points ABC in the front of the body are fairly tuned up before adding the fourth, the legs D, in the back, because it must blend into the priority of the synchronization in front. I had you work through sync point pairs in short repeats without breathing, and then tested it with breathing strokes. I noted, and you observed, that it is quite difficult to hold all four ABCD sync points in attention at once. As long as you circulate through the pair and triplet combinations you may sufficiently tune up the whole body. You are practicing to not only make them coincidental, but to have the points blended together, working as a smooth whole- feel the wave of force travel smoothly from one side of the body to the other, from one end of the body to the other. There is endless opportunity to improve synchronization, at different tempos, at different intensities. It is really satisfying work because when you hit the sweet spot it feels good flowing, it conserves energy a bit more, and makes higher effort swimming feel much better. I mentioned that you might be interested in working through the MC Sync course at some point. It would take you through an 8 week practice plan to work on all these combinations of synchronization, centered around a 400 test swim. When you get back to regular practice just let me know what your questions are and what you have in mind to work on. I am here to continue to dialogue with you! Again, thank you for a great experience. It taught me some fine points in technique that eluded me before. It allowed me to feel what you meant by synchronization, and challenged me to connect the two. More importantly it brought me back to mindful swimming. A practice that I have lost over the last couple of years. It was a pleasure to work with you in person!! And, as we discovered, it helped to explain some of these concepts in person and then immediately experiment in the water in order to feel what we are aiming for rather than just reason about it through typing. Please feel free to stay in communication here about your observations and any questions you may have as you get back into it. I imagine you will have new insights and questions about synchronization – there is an endless amount of detail there to study and improve.